ECT (Apoxina / Gi'iwa Rec.) U.K.
BEARDY WEARDY (Wildthings Rec.) U.K.
PURPLE WIZARD (Autonomous Collective) U.K.
KAINED & ABLE (Arkona Creation / Glitchy Tonic Rec.) U.K.
OOOD (Phar Psyde Rec. / Broken Robot Recs.) U.K.
TANTRIX (Blue Hour Sounds) U.K.
MR MIRRA (Broken Rec.) U.K.
SIMON PIEMAN (Broken Rec./ Tribe Of Frog) U.K.
GEO (Broken Rec. / Tribe Of Frog) U.K.
HAMISH (Furthur Progressions/ Alchemy Rec.) U.K.
PAUL (Planet Bob ) U.K.
SPOONA (Planet Bob ) U.K. 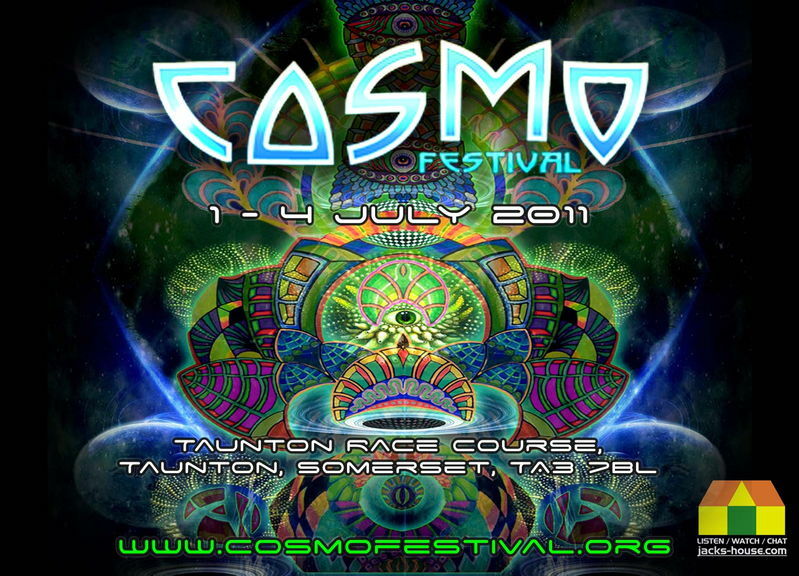 Inspired by the sense of community and warmth Cosmo Festival will be back to celebrate our 2nd anniversary from 1st - 4th JULY 2011. Featuring a top line-up of DJs, live music and multimedia artists to keep you fully entertained into the festival. Some amazing decor artists and installation crews are collaborating a theme this - building a small playground of fun. Other than the obvious, the event will also include workshops, healing area, market, restaurants/ bar for all food lovers & a lot of performances to keep you entertained and thrilled. Thank to all who have helped spread the word and we can feel the excitement & vibrations amongst people anticipating COSMO FESTIVAL 2011... in many accounts we already have taken upon making it even a grand experience than last year.. We hoping that we gather a large audience to come and witness this amazing gathering.. full of colours and amazing vibes.